At 13, Michael Brodhead was wise beyond his years. He loved school and airplanes, played baseball, and participated in junior golf tournaments, bowling competitions, and water-skiing endeavors. Michael never held back from life even in the face of adversity. When Michael was born, doctors performed an operation immediately because his heart was on the wrong side of his chest. It was one big chamber instead of four separate ones, and none of his vessels were hooked up to his lungs. At birth, Michael defeated the odds and he continued to do so for the next 13 years of his life. Michael’s disability created obstacles that he had to navigate throughout his childhood. Luckily, he was surrounded by support. His parents were always sure to be transparent with their son from the beginning. This familial integrity allowed Michael to be more aware of his own limitations. “With Michael, we were always honest with him about his condition, and he was always honest with us about how he was feeling,” Rob said. With the guidance of a thoughtful pediatrician, Michael knew his own limits regarding his disability. According to Rob, Michael usually knew when to draw the line. Tackle football was an exception. With this encouragement and support, Michael was able to own his disability instead of the other way around. His physical limitations never defined how hard he worked or the types of things he did. If Michael wanted something, and knew he could achieve it physically, he went for it. Rob recalls that, despite extraordinary circumstances, Michael strove to have a normal childhood. Rob attributes his son’s affinity for school to his desire to be like his peers. 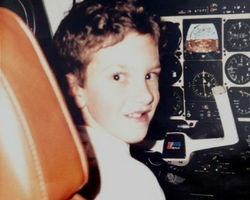 At age 13, Michael’s condition worsened and he passed away. His impact remained. The next year, the school’s yearbook was dedicated to his legacy. Michael’s love for school and his classmates is part of the reason the Brodhead family thought a scholarship might be an appropriate way to memorialize their son, brother, and friend. In Michael’s obituary, the family asked for donations to a fund at a local bank instead of flowers. That fund was soon turned over to The Community Foundation of Muncie and Delaware County. The Michael Brodhead Scholarship is awarded to a student who has overcome a physical disability, demonstrates good moral character, maintains good scholastic standing, and participates in extracurricular activities. These eligibility requirements are in line with Michael’s hard work and positive attitude. The scholarship fund at The Community Foundation will continue forever, ensuring the name and memory of Michael live on. Even with a poor prognosis, Michael had an impact on everyone he encountered. The nursing staff and his family appreciated Michael’s positive outlook. “The nursing staff at Ball hospital wrote us a note and said that during his last three months, Michael had so much spirit and rarely did they see him without a smile,” Rob said. Rob recalls one of his favorite memories about Michael. Michael made reservations at Foxfires for his parents on their anniversary, had Rob’s assistant get an anniversary card in which he wrote a personal note and signed it, and somehow ordered of a bottle of wine, all from his hospital bed. In the last few months of his life, family members from all over the country came to visit. Michael knew his time might be running out soon, but he still made his last memories with his family special. Rob recalls Michael saying he didn’t want to be forgotten. His vast impact and contagious positive attitude has made forgetting him impossible for all who knew him. Creating a memorial scholarship fund in his name has made it easy for his family to pass on his legacy to other students who have overcome physical disabilities. The Brodhead family knew Michael would have gone on to college if he had the chance, so they wanted to pass that chance on to other students like Michael. When his parents were still in Muncie, they went to the local high school’s awards ceremonies to present Michael’s scholarship to the recipient. Being able to share Michael’s story with students in the community has been special to them. The family now lives in Arizona and Wisconsin, but they are still able to see the impact Michael’s scholarship has had on its recipients through ‘thank you’ notes. Patrick, Michael’s brother, has taken on more responsibility in the award process. Eventually, he will take over the duties his parents have had in the process, and now will have some say in who will receive the scholarship each year. Patrick welcomes the opportunity to help continue his brother’s legacy. Rob recently had the opportunity to come back to Muncie. Rob visited Ball Memorial Hospital where Michael spent the last few months of his life. He also got to visit Michael’s grave. Coming back to Muncie was an opportunity to remember Michael’s impact on a community that impacted Michael as well.